New Bethel Baptist Church - Rev. Robert Smith Jr.
Pastor Robert Smith, Jr. is the third of ten children born to the late Reverend Robert Smith, Sr. and Ollie Mae Smith of Pensacola, Florida. His formal education was obtained in Pensacola and Birmingham, Alabama after his family relocated. Robert received the Bachelor of Arts Degree from Miles College, Fairfield, Alabama in 1974 and the Master of Divinity from New Orleans Baptist Theological Seminary, New Orleans in 1976. He continued studies at Drew University in the Doctor of Ministry Program and in the Doctoral Program at Houston Theological Seminary, Houston, Texas. Pastor Smith heard the call of God early in life and has been a minister most of his life and a pastor for more than forty years. Pastor Smith succeeded his father upon his death at Bethel Baptist Church, Pratt City (Birmingham) Alabama in 1975. In 1982, Pastor Robert Smith, Jr. accepted the call to serve as Co-Pastor of New Bethel Missionary Baptist Church. Upon Rev. Franklin's death in 1984, Pastor Smith became Pastor of New Bethel Missionary Baptist Church. Pastor Smith proudly pastors New Bethel where ministry extends beyond the walls through Angel Land Day Care Centers, AA and NA Support Groups and the Samaritan Ministry which provides clothing and food weekly to those in need to name a few. Pastor Smith is a member of the Executive Board of the Michigan Chapter, Southern Christian Leadership Conference (SCLC) and is past Vice President of the Detroit Chapter NAACP. Pastor Smith blogs for the Detroit News. Dr. William J. Shaw appointed Robert Smith Chairman of the Evangelism Board of the National Baptist Convention, USA, INC. in 2002. In June 2007, Dean George Waddles, Sr. appointed Pastor Smith lecturer of the Minister's Wives and Widows for the Congress of Christian Education. Pastor Smith has written three books entitled "In The Shadow Of C.L.Franklin; Tragedy,Trials,Triumph and Is It Church Yet?" which was featured in The Detroit News Saturday, August 9, 2014. Pastor Smith currently serves on the National Baptist Convention, USA INC. Board of Directors appointed by President, Dr Jerry Young; Foreign Mission Board of the National Baptist Convention, USA INC.; Chairman of Foreign Mission for the BM&E Convention; Chairman of the Foreign Mission of Michigan District Association; on the Board of Evangelism and on the Theological Commission of the National Baptist Convention, USA INC. He also serves on the Round Table of the City of Detroit under Mayor Mike Duggan. 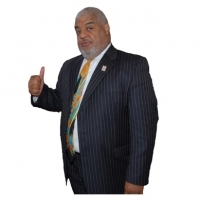 Pastor Smith has received many accolades and awards. His travels are extensive to include two tours of the Holy Land, Germany and the Bahamas. He is a sought after Evangelisst and Vocalist. Born with a passion for the down and out, Missionary Robert Smith, Jr. is the Founder and Chair of the Haiti Mission Alliance. His pilgrimage takes him to Port Au Prince, Haiti at least six times yearly as he provides for the needs of the people. Robert Smith, Jr. and his best friend Cynthia will celebrate forty-six years of marriage on December 23, 2018. They have one son, Rev. Conderidge Robert Smith; two daughters Sherique Moshelle Ransby, Terique Moshelle Parker, Esq. ; two grandsons, Joshua Robert Smith and Austin Olander Ransby; two granddaughters, Grace Elizabeth Cynthia Smith and Lauren Moshelle Ransby; one god-daughter, Erma Lee McQueen. A preaching preacher with A Mind To Live For Jesus, Pastor Bob continues to proclaim, How Good The Lord Is!